This is a very special and surprisingly timely cake, considering the recipe dates from the early 20th century. There's a viral (as in 2.2 million views) -- and very moving -- graham cracker video exploding on the internet today: Click here to watch it and then you can feel really good about buying the graham crackers to make this delicious cake. The recipe is courtesy of Ellen Snyder-Grenier, curator and historian extraordinaire, who is working on an exciting history project at Henry Street Settlement, my place of employ. This is a cake her late mother, Mildred Snyder -- and her grandmother -- used to make often. Mrs. Snyder, who was so health conscious that she believed that an Oreo was actually two cookies, not one, liked this cake for its wholesomeness. 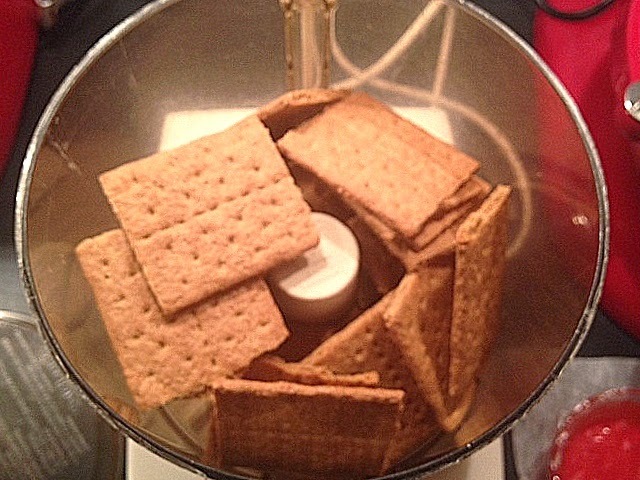 Graham crackers were once thought to be a health food and the custard filling is barely sweetened (but still wonderful). This is not an easy dessert: It requires the cake, a filling and separate frosting. But, trust me, it is worth the effort. Get started by crushing the graham crackers, which you can do (as Mrs. Snyder did) by placing them in a plastic bag and rolling over them with a rolling pin. Or you can give them a whirl in your food processor. Spoon the batter into two greased and floured eight-inch cake pans. Using the back of a spoon or an offset spatula, coax the batter to the edges of the pan. 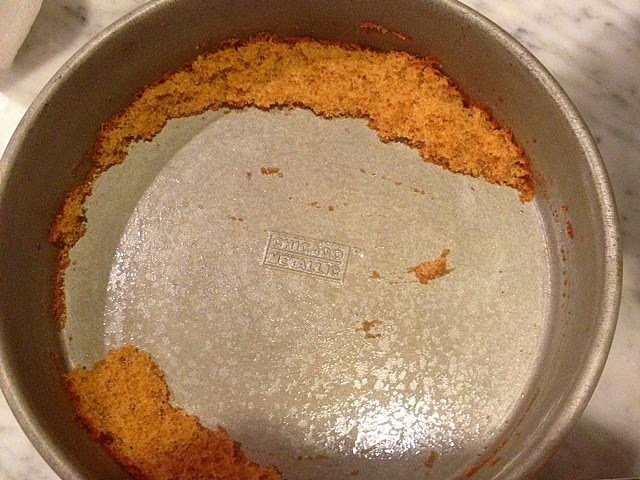 Neither layer released from the pan very well. But it's not much of a problem -- you can use a small offset spatula or butter knife to lift the remaining pieces from the pan and, pretending it's a jigsaw puzzle, fit the pieces where they belong on the cake. Once the cake is filled and frosted, no one will be the wiser. You might also try lining the bottom of each pan with a parchment round to ensure an easy release. 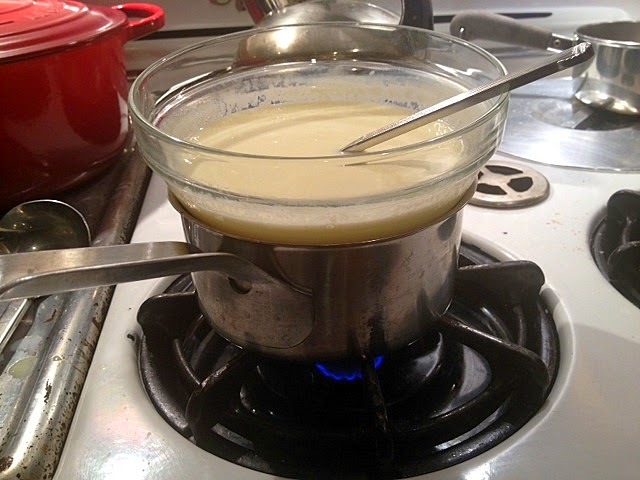 The custard filling, called cornstarch pudding on the recipe card, is made in a double-boiler. If you don't have one (I don't! ), just place a bowl over a saucepan filled with simmering water. 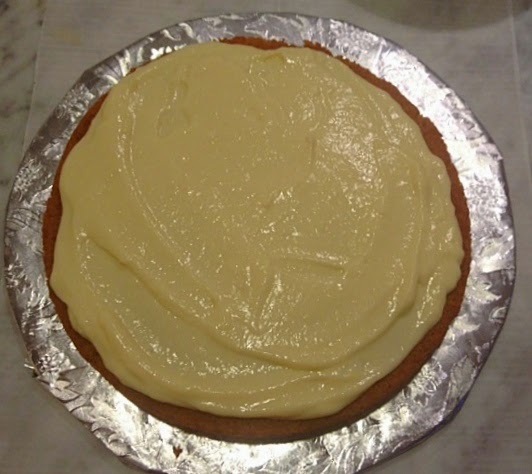 When the cake layers are cool (and after the custard has cooled) fill the cake. 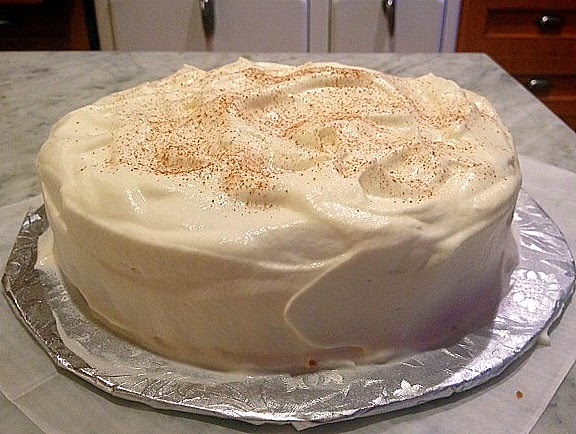 Next, frost the cake with whipped cream frosting. I sprinkled the top with a bit of cinnamon for decoration. 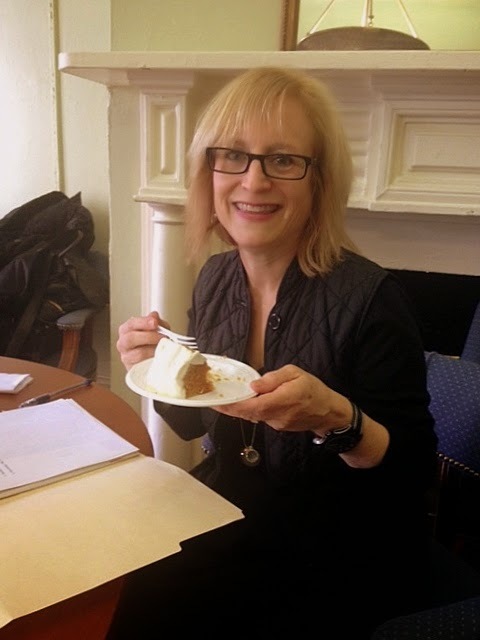 Ellen enjoying a slice of graham cracker cake. 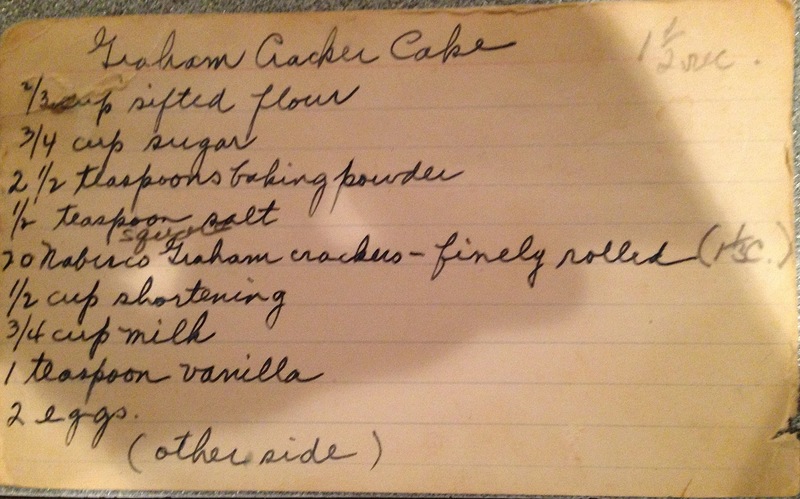 Ellen reports that the Graham Cracker Cake recipe card was most likely written by her grandmother, who was born around 1900. 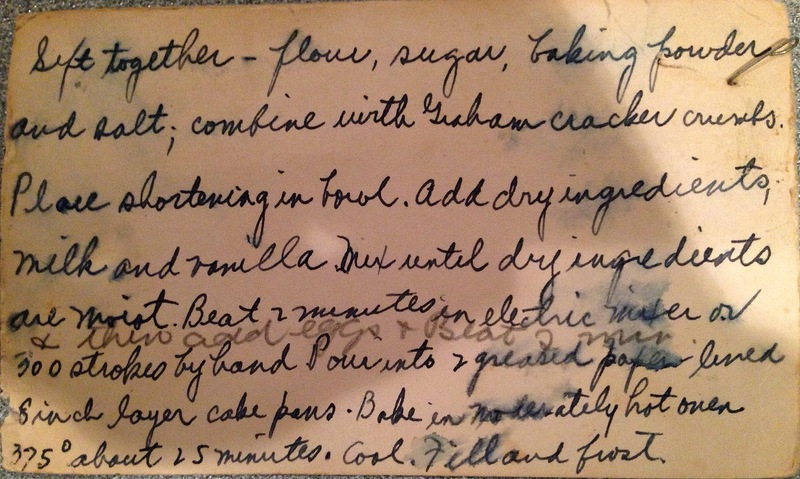 She found another recipe card for the cake in her mother's handwriting, titled "Mom's Cake." 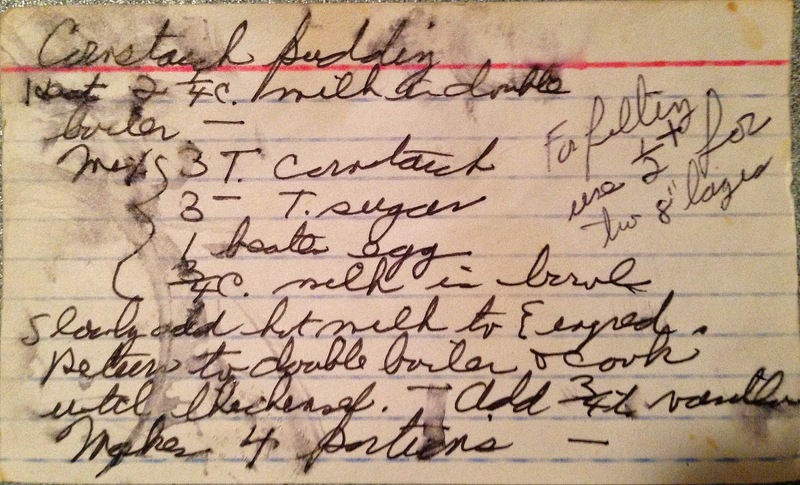 The Cornstarch Pudding recipe is in her mother's handwriting. Production notes: I used room-temperature unsalted butter instead of shortening, and mixed it with the dry ingredients before adding the milk. I wasn't sure it would work the way it's written -- I've never seen this method before. 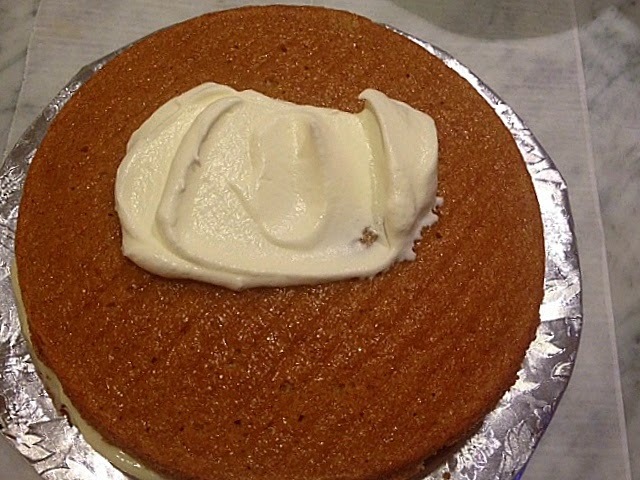 For the frosting, I simply whipped some heavy cream with a bit of confectioners' sugar and vanilla -- that's what Ellen remembers her mother doing. (To make the best whipped cream, buy cream that is not ultra-pasteurized and keep the bowl and beaters in the freezer for 20 minutes before mixing.) I kept the cake refrigerated on account of the whipped cream frosting. 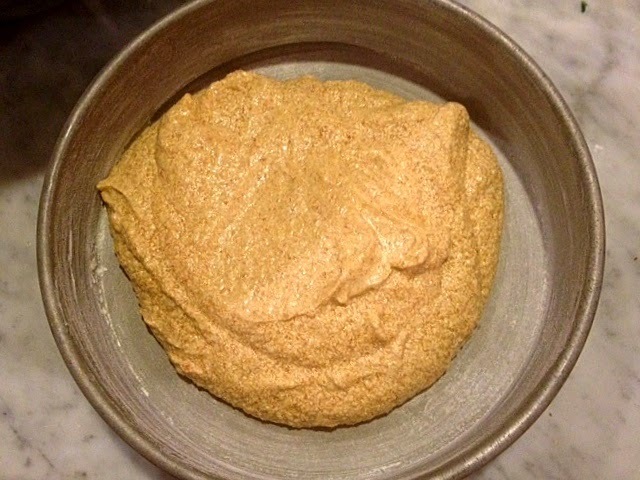 Sift flour, sugar, baking powder and salt, and combine with graham cracker crumbs. Place shortening in a bowl. Add dry ingredients, milk and vanilla. Mix until dry ingredients are moist. Beat two minutes in electric mixer (or 300 strokes by hand). Add eggs and beat for two minutes. Bake in moderately hot oven (375 F) about 25 minutes. Cool, fill and frost with whipped cream frosting. Production notes: Ellen remembers her mother serving the pudding separately, and this recipe makes four portions. 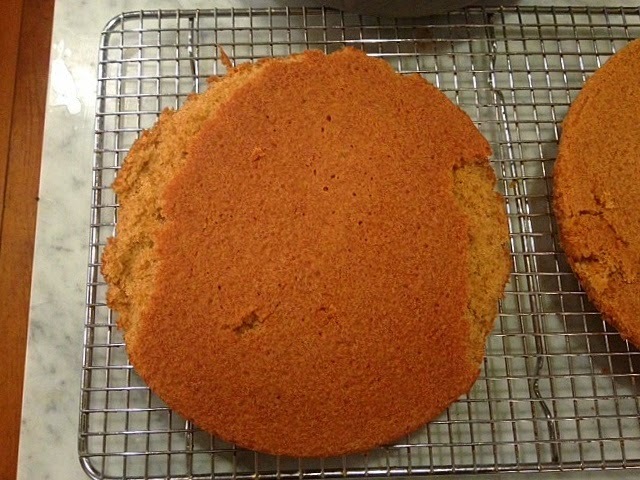 For the cake, simply divide in half, but you can use an entire egg, rather than trying to use half an egg. Let it cook in the refrigerator before using it to fill the cake. Mix 3 T cornstarch, 3 T sugar, 1 beaten egg and 3/4 c milk in a bowl. Slowly add the hot milk to the ingredients in the bowl. Return to double boiler and cook until thickened. 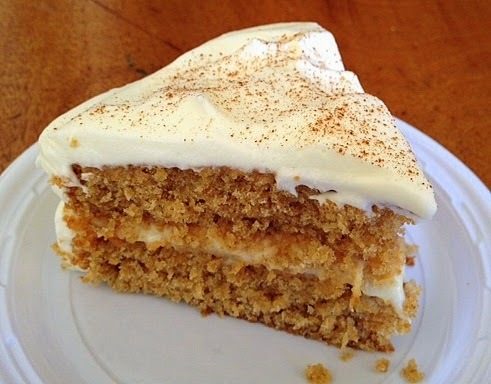 I have been making a graham cracker cake for years, a cross between a coffee cake and a plain snack cake. It is delicious. When I spotted this I knew I had to make it. thanks. i made a graham cracker bread but this sounds much better! I would be tempted to try this with Nabisco chocolate wafers. What a funny coincidence! I read this post earlier tonight, and then was looking through a pamphlet I picked up at a sale at our local senior center. This recipe, without the filling is in the Good Housekeeping Cake Book from 1958. I have to try it! !